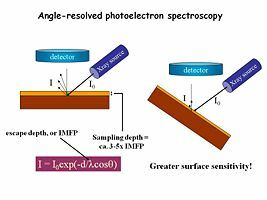 X-ray Photoelectron Spectroscopy and UV Photoelectron Spectroscopy are techniques for studying surface characteristics of materials. 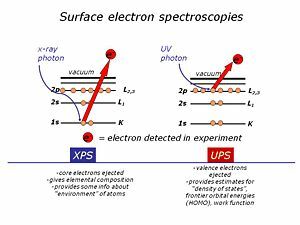 XPS uses high energy X-ray photons to excite “core” electrons in the near-surface region UPS uses lower energy photons in the deep UV region to excite valence electrons. 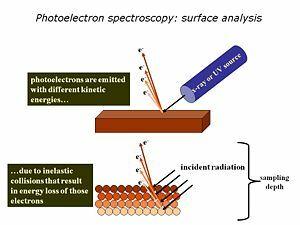 The small sampling depth of XPS and UPS arises because most of the photoelectrons generated do NOT make it out of the solid – they are scattered below the surface and not detected. Only those within 1-10 nm of the surface get out and can be analyzed. Here is a typical “survey spectrum” for a clean gold surface, modified with a single monolayer of a phenyl-terminated alkanethiol. We plot number of emitted photoelectrons on the y-axis, and their binding energy (BE) or kinetic energy (KE) on the x-axis. The photoelectric effect applies (as first described by Einstein) – there is conservation of energy, and you can see that the BE of each photoelectron is related to the excitation source energy, the measured kinetic energy of that photoelectron, and a “work function” of the spectrometer (constant). Each element provides us with at least one photoemission peak, with a distinct BE or KE. 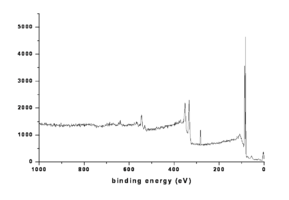 Spectra a,c and e are “normal takeoff” angle spectra of the O(1s) region from indium tin oxide surfaces that have been subjected to various pretreatments. Spectra b,d and f are from the same samples, with high takeoff angles of analysis, giving more near-surface information. In this case we see new peaks from hydroxyl (-OH) species located right at the surface of the oxide. 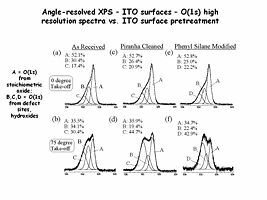 These high resolution XPS spectra show the power of the technique for the characterization of ITO surfaces with different PA modifiers. Note especially the C(1s) spectra region in (b) where we observe several different peaks due to carbon in its various forms within each molecule. 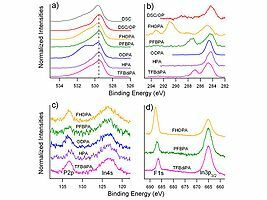 The peak with a binding energy (BE) of ca. 285 eV is due to carbon in the backbone of the molecule, whereas higher BE peaks are seen for carbon bonded to fluorine (see the peaks at 291 and 293 eV for FHOPA). Similar molecular differences are seen in the O(1s) (a) P(2p) and In(4s) © and F(1s) spectral regions. Using UV photons as the excitation source we probe photoelectrons emitted from the valence band region of our materials of interest. 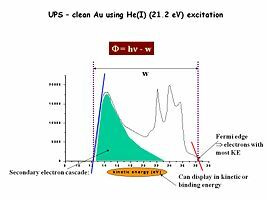 Here for example is a UPS spectrum (He(I) excitation) for a clean gold surface. 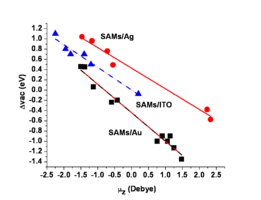 The regions of most interest are the high kinetic energy photoelectrons, and the energy where we begin to detect them (red line) and the low kinetic energy electrons and the lowest energy where they can be detected (blue line). The energy difference between these two threshold energies (w), subtracted from the source energy (21.2 eV) gives us an estimate of the effective surface work function of this material – in this case the work function for clean Au is about 5.1 eV. 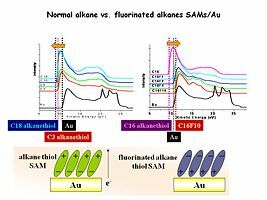 Now we have added a single monolayer of an alkane thiol modifier, which binds strongly to the Au surface, and changes the UPS spectrum, the effective work function of the Au surface. This modifier is a 12-carbon chain, terminated with a phenyl group, and we see a new ionization peak (orange) for the ionization of these phenyl groups. The width of the photoemission spectrum has changed as well, indicating a new work function for this modified Au surface. Now we see a series of UPS data for Au surface modified with alkanethiols of different lengths (from C3 to C18) (left panel) and a similar series of alkanethiols which are fluorinated at 1,2,4 and 10 positions along the chain (right panel). At the bottom of the screen we have schematically shown the orientation of the molecular dipole moments for these modifiers – the normal alkanes point the positive end of the dipole away from the surface, and lower the work function; the fluorinated alkanes point the negative end of the dipole away from the surface and increase the work function. 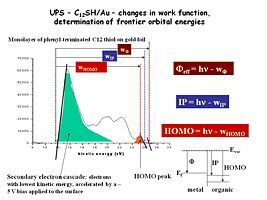 The presence of these surface modifiers either increases or decreases the energy of the low kinetic energy edge of the UV-photoemission spectrum, and these shifts correspond to changes in the effective surface work function of the conductor. Here we show that we can plot these changes in effective work function as a function of the molecular dipole moment of the modifier. The black squares correspond to self-assembled monolayers (SAMs) on gold (Au) surfaces, the red circles correspond to similar series of molecules on silver (Ag) surfaces, and the blue triangles correspond to a series of phosphonic acids attached to indium-tin oxide (ITO) surfaces. Note that the slopes of these plots are nearly the same, suggesting that the molecular dipole moment for the modifier is the most important attribute of these molecules. Note also that we can change the effective work function of these surfaces by up to ca. 1.8 eV!! This page was last modified on 18 January 2012, at 11:32.